Our orchard, now in it’s second year, (and first year of fruiting) has produced 8 varieties of apples out of the 17 types that we planted. Most of the trees had flowers, and it is my guess that the intensely early heat and dryness that we experienced last spring might have contributed to incomplete pollination of many of the trees, or the flowers prematurely falling off. We have the trees on an irrigation system to help establish the trees in their early years, but it was indeed a challenging season for water and heat. Lodi- early transparent from 1924, USA. Good fresh eating (if harvested at the right time!) We didn’t get a picture but it looked like a transparent- greeny yellow and soft. 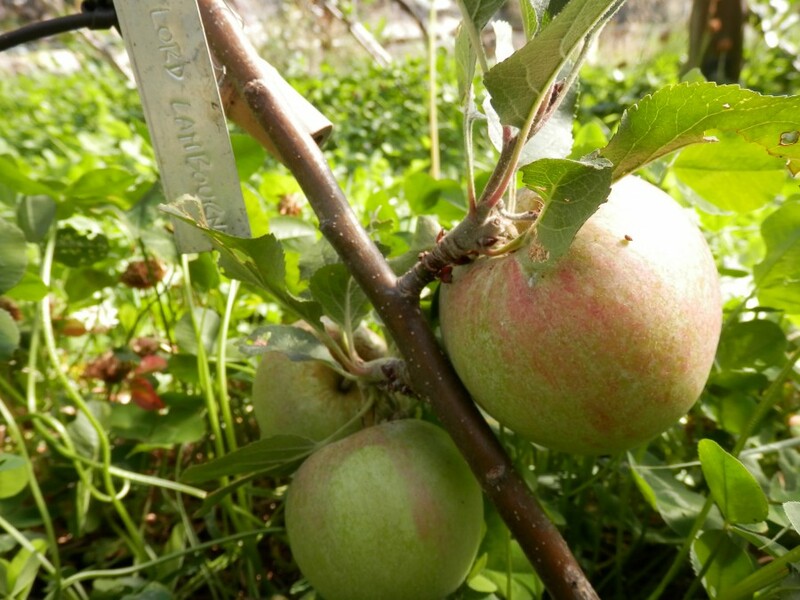 Lord Lambourne- produced the most this year, with a harvest of 9 apples between 2 trees! 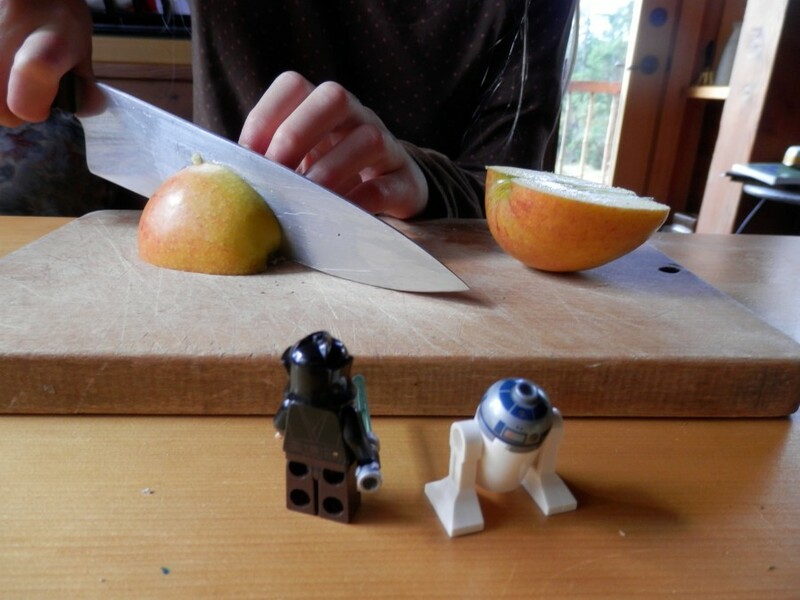 A delicious, juicy, crunchy, flavourful apple that we all loved. From 1923 in England. Mid season. 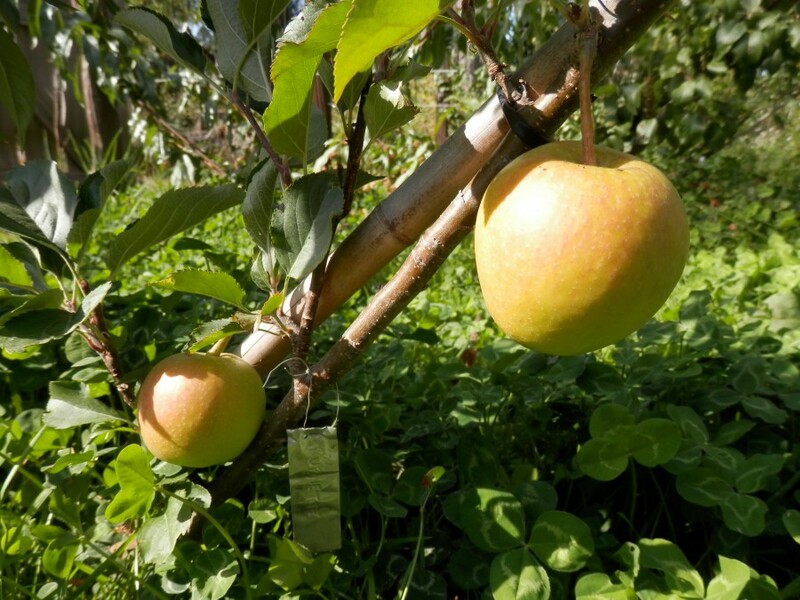 Rubinette- only 2 apples, fruity and a beautiful red blush over a yellow background. Almost glowing in colour. 1966, Switzerland- not entirely a heritage. Mid season. Bramley’s Seedling- definitely a late season as the 2 huge apples we got were still tart and a bit hard. However, the description we found said tart, excellent baking apple that keeps 4 months. 1809, England, gives it official heritage status in my mind. Snow- We got 8 of these little gems between the 2 trees. They are bright red and beautifully round. Late season, so we haven’t picked them, but my son ate one and said it was delicious. Trees Of Antiquity says this: Snow Fameuse is one of the oldest and most desirable dessert apples, a parent of the aromatic McIntosh. 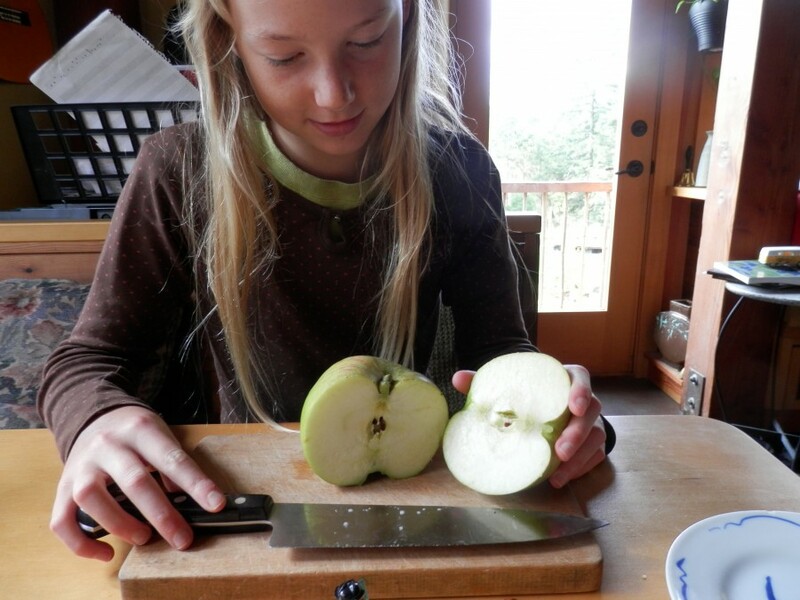 It was found in almost every French settlement, in the late 1700’s, as the Snow apple was planted 1,000 miles in every direction of Canada and the lower states. Flesh is tender, spicy, distinctive in flavor, and snow white in color with occasional crimson stains near the skin. 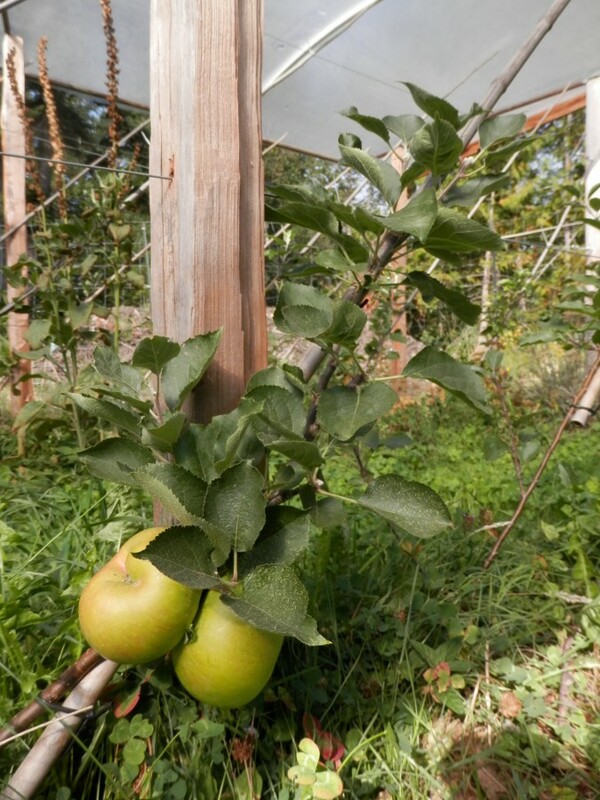 Snow apple is very hardy, heavy bearing tree that is excellent for home orchards. Snow Fameuse is delicious fresh off the tree, in cider, or in culinary creations. 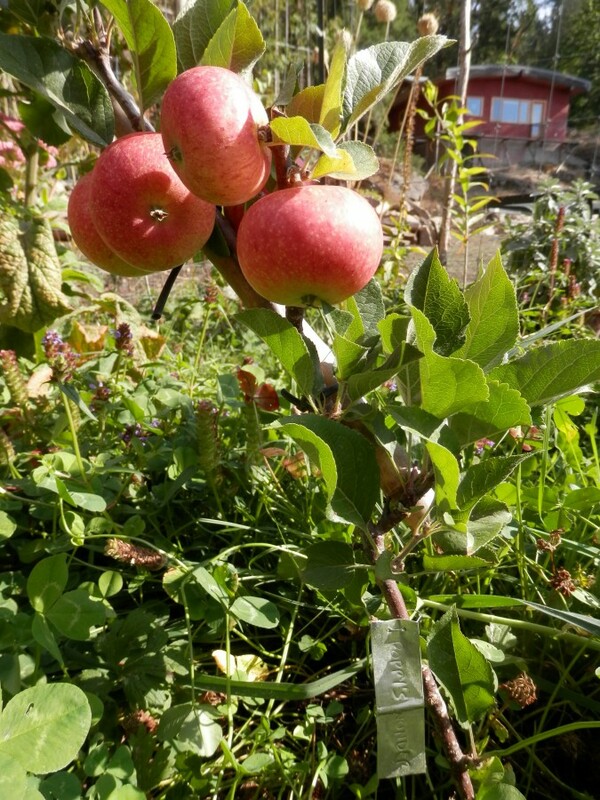 One of very few apples that often reproduce true to variety when established from seed. Tydeman’s Late Orange- As named, another late variety, but we only had one so we went ahead and tried it. From England, 1949, good fresh eating and can store for 5-6 months. Poppies’ Wonder- I couldn’t find much about this variety, and I think this is why- “In the 1990’s, there have even been some great recent chance seedlings such as Poppy’s Wonder, created when a Cox seed was thrown in a compost pile in Victoria, BC and this fabulous apple tree resulted.” Harry Burton, on why we don’t need a GE apple.I think it is a late season apple, very red and round and sweet. 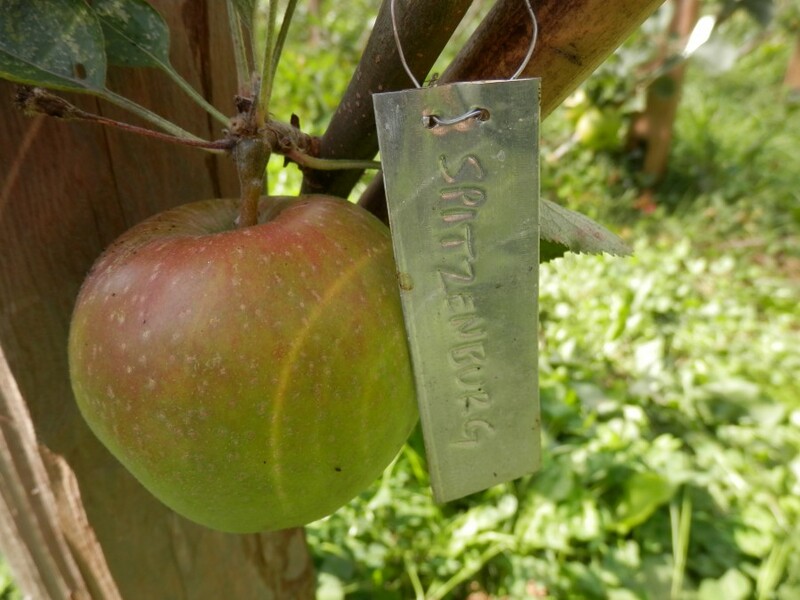 Spitzenburg- This single apple we harvested was fantastic. 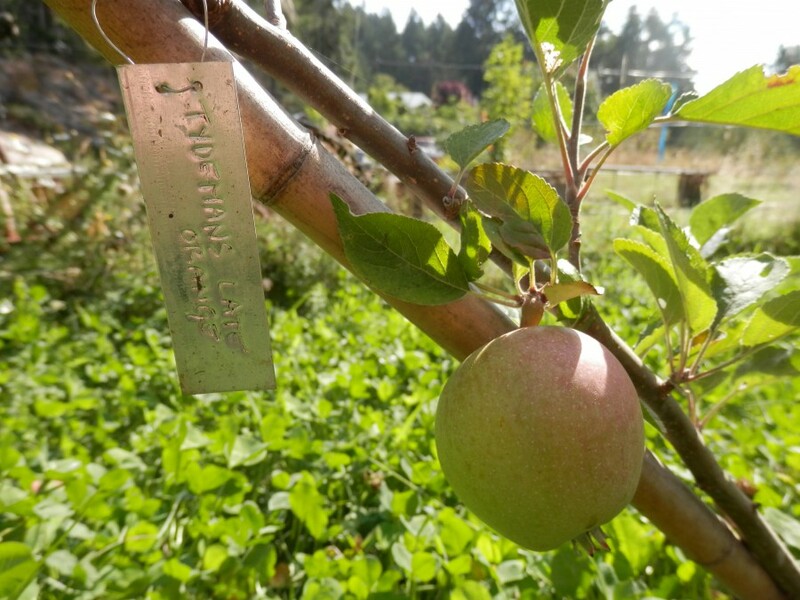 Another heritage- Spitzenburg apple was discovered in the late 1700s by an early Dutch settler of that name. It was found at the settlement of Esopus, on the Hudson River, in Ulster County, New York. 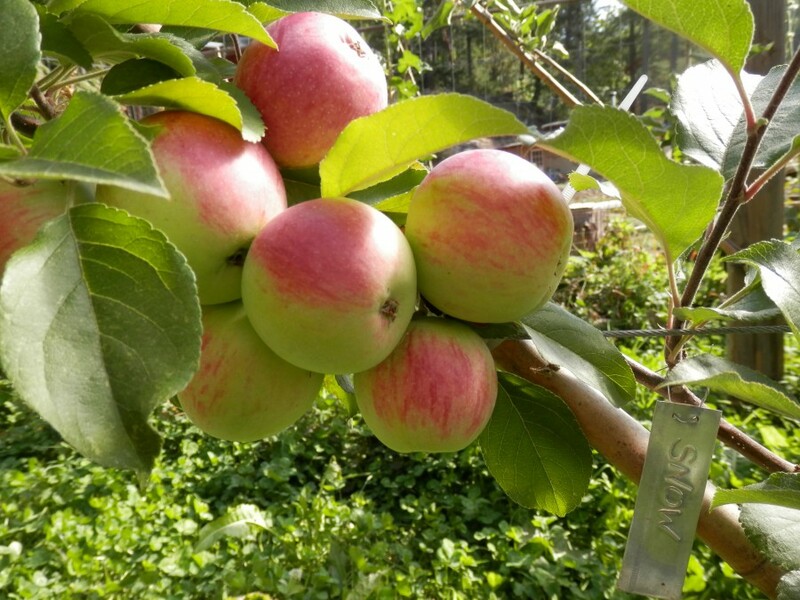 Much attention was bestowed upon Spitzenburg apple when Thomas Jefferson ordered a dozen trees for his orchard in Monticello. Unexcelled in flavor or quality, the fruit is great off the tree, but flavor radically improves in storage. 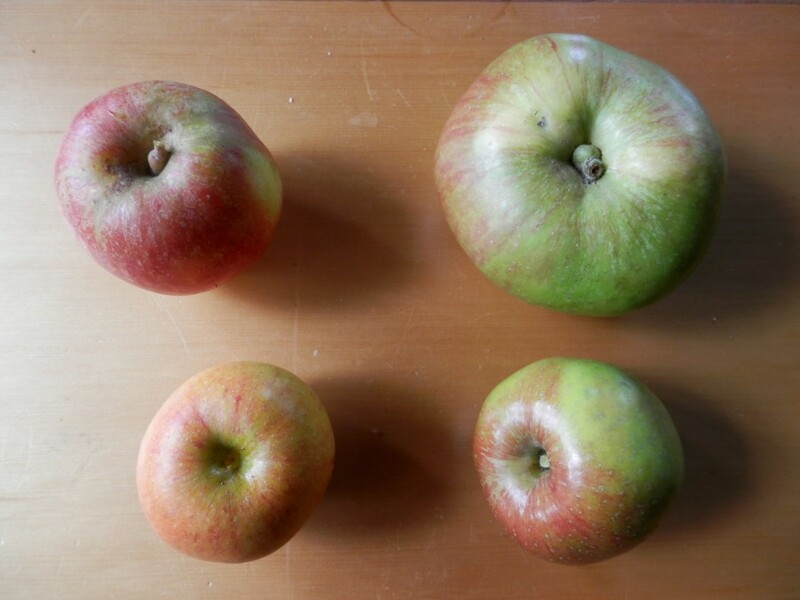 Medium apple with crisp, yellow skin covered with inconspicuous red stripes and russet freckles. Flesh is tinged yellow, firm, aromatic, and complex in flavor; a perfect balance between sharp and sweet. Late season. 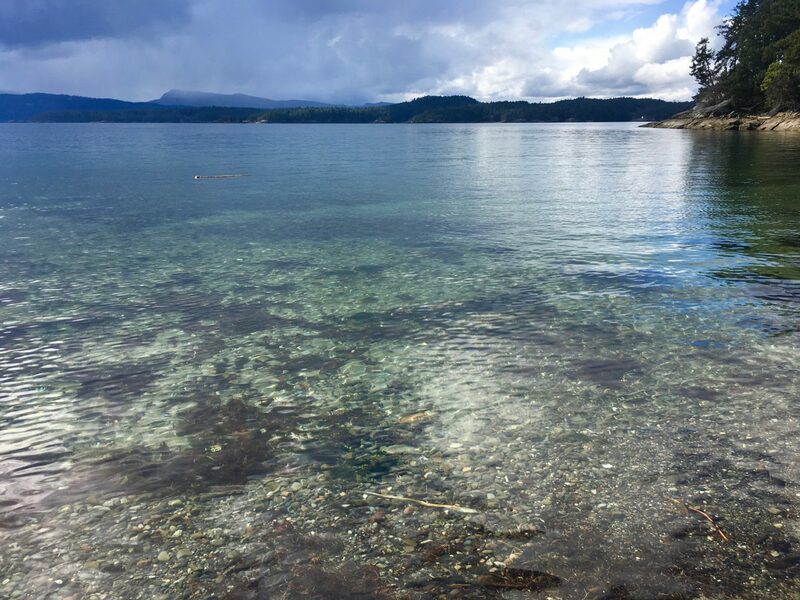 So much to learn and discover! We look forwards to getting to know the rest of the apples as they begin to produce in the coming years, along with the apricot, nectarine, peach, pears, and quince- and the plums and asian pears that we have ordered for planting in march. Thank you for a interesting page!